Biological engineering has the potential to affect virtually every sector of the economy that relies on fossil fuels – not only transportation fuels, but also lastics, paints, cosmetics, adhesives, carpets, textiles and thousands more consumer products. Advocates assure us that the “food vs. fuel” debate will be irrelevant in the future sugar economy, because feedstocks will come from cheap and plentiful “cellulosic bio- mass”– plant matter composed of cel- lulose fibers (including crop residues such as rice straw, corn stalks, wheat straw; wood chips; and dedicated “energy crops” such as switchgrass, fast-growing trees, algae, even mu- nicipal waste). The giant stumbling block is that it currently requires a lot of energy to break down some biological feedstocks into sugar, and traditional chemistry has failed to provide an eco- nomical process. Proponents insist that “next generation” feedstocks will use old and new biotechnologies, as well as break-through fermentation tech- nologies, to succeed where chemistry failed. 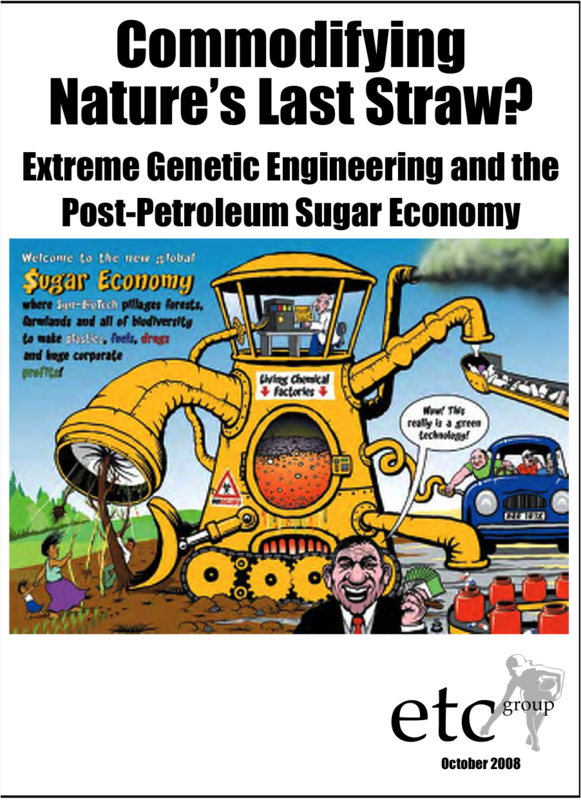 What is the sugar economy? Syn Bio enthusiasts envision a post-petroleum era in which industrial produc- tion is fueled by sugars extracted from biological feedstocks (biomass). The biotech industry’s bioeconomy vision includes a network of biorefineries, where extracted plant sugars are fermented in vats filled with genetically engineered – and one day, fully synthetic – microbes. The microbes function as “living chemical factories,” converting sugars into high-value molecules – the build- ing blocks for fuels, energy, plastic, chemicals and more. Theoretically, any product made from petrochemicals could also be made from sugar using this biological manufacturing approach.